In a public letter published Tuesday, retired Justice Sandra Day O'Connor announced she has been diagnosed with the early stages of dementia, and possibly Alzheimer's. The 88-year-old also revealed that due to the disease, she will no longer be participating in public life. 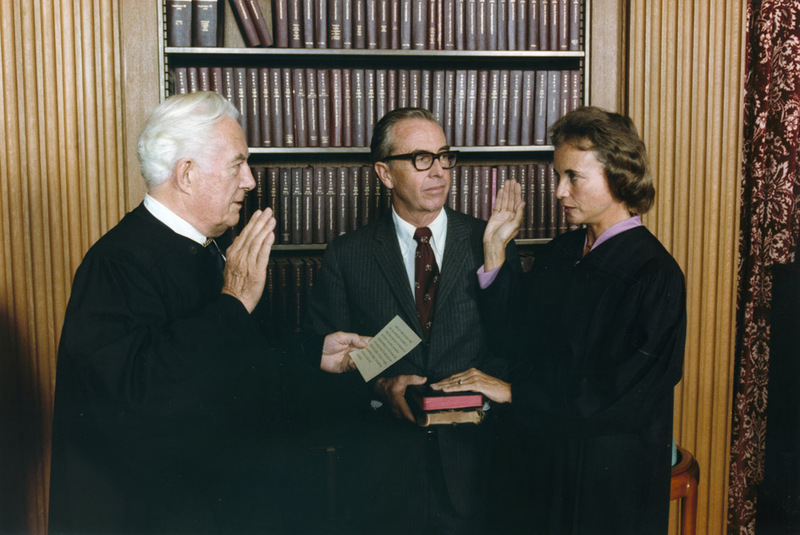 O'Connor is most well known for being the first woman to sit on the Supreme Court, which she was nominated to by President Ronald Reagan in 1981. She was confirmed in a 99-0 vote by the U.S. Senate. In her letter, O'Connor urged young people to get involved in civic learning and political engagement. "We must reach all our youth, and we need to find ways to get people – young and old – more involved in their communities and in their government. As my three sons are tired of hearing me say, 'It's not enough to understand, you've got to do something.' There is no more important work than deepening young people's engagement in our nation." She also gave thanks for everything that she has been able to accomplish. "While the final chapter of my life with dementia may be trying, nothing has diminished my gratitude and deep appreciation for the countless blessings in my life," she wrote. "How fortunate I feel to be an American and to have been presented with the remarkable opportunities available to the citizens of our country. As a young cowgirl from the Arizona desert, I never could have imagined that one day I would become the first woman justice on the U.S. Supreme Court." O'Connor will continue living in Phoenix, Arizona surrounded by her friends and family. O'Connor began her career in law at Stanford Law School, where she graduated in 1952. It was only after graduation that O'Connor realized how hard it was for a woman to get a job as a lawyer. As she told told NPR's Terry Gross in 2013, "I called at least 40 of those firms asking for an interview, and not one of them would give me an interview. I was a woman, and they said, 'We don't hire women,' and that was a shock to me." O'Connor went on to become a Deputy County Attorney of San Mateo, California, a civilian attorney for the United States Army in Frankfurt, Germany and the majority leader of the Arizona State Senate. In 1979, she was appointed to the Arizona Court of Appeals – two years later, President Reagan called to let her know she was being nominated. "I was working in my office on the Arizona Court of Appeals," she told Gross. "I was at the court in my chambers when the telephone rang. And it was the White House calling for me, and I was told that the president was waiting to speak to me. That was quite a shock, but I accepted the phone call, and it was President Reagan, and he said, 'Sandra?' 'Yes, Mr. President?' 'Sandra, I'd like to announce your nomination to the U.S. Supreme Court tomorrow. Is that all right with you?' Well, now, that's kind of a shock, wouldn't you say?" When describing what it was like to be the first woman on the Supreme Court in the same interview, O'Connor said that she "felt a special responsibility" as the first woman to "perform in a way that wouldn't provide some reason or cause not to have more women in the future." Ruth Bader Ginsburg, in 1993, was the next woman to be confirmed as a Supreme Court Justice. O'Connor found her addition to be a "welcome change," as she told NPR's Nina Totenberg in 2003. "The minute Justice Ginsburg arrived, the media pressure was off — I think for both of us. And we just became two of the nine justices." O'Connor retired in 2006 to take care of her husband after he was diagnosed with Alzheimer's.